oledump.py has the –calc option to calculate the MD5 hashes of each stream (if you need another hash algorithm, use option –extra). This time I needed the hashes of the decompressed macro streams, and not of the raw streams. 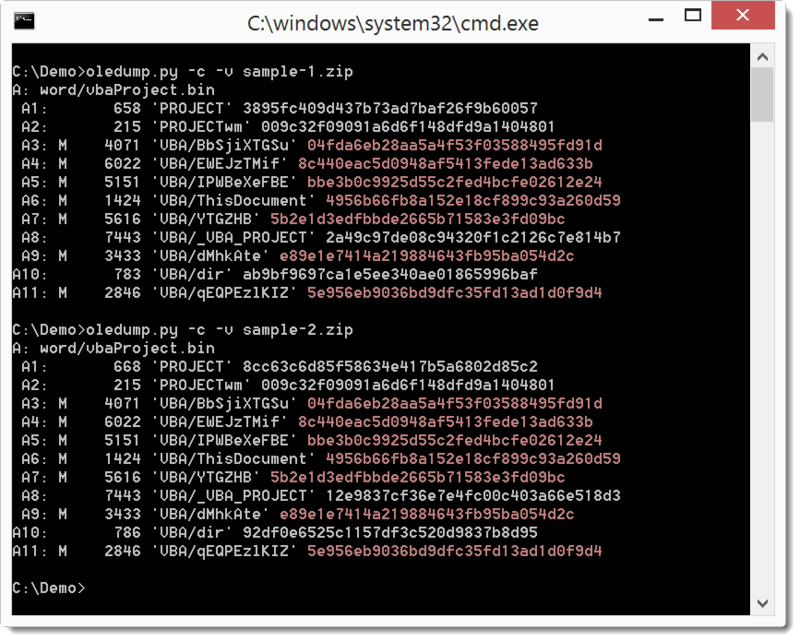 So I updated oledump.py to support using options –calc and -v together (and also option –extra and -v). When you use option –calc (or –extra) with option -v, raw macro streams (indicator m or M) will be decompressed and the hash of the decompressed macro will be calculated. I needed this option to compare two samples that were different, but probably very similar. Here I can see that the hashes of the macro streams are identical, hence that although I have 2 different samples, the VBA code is identical. While your software is excellent, I’m still seeing an issue with docx files. It fails to recognize them as office documents and gives no output. If I manually unzip it, it does appear to be a word document, with lots of .xml files. Any advice? @Robert No, there is no issue with the tool, this is expected bahavior. .docx files do not contain macros. Try a .docm file, they contain macros. That explains it. Thanks for all you do.